Click on the NYT link above to see a short slide show of the Biomuseo. For more than a century, Panama has been known as the mosquito-infested tropical country where workers battled yellow fever as they cut the 48-mile canal connecting the Atlantic and Pacific oceans that changed the course of global trade. 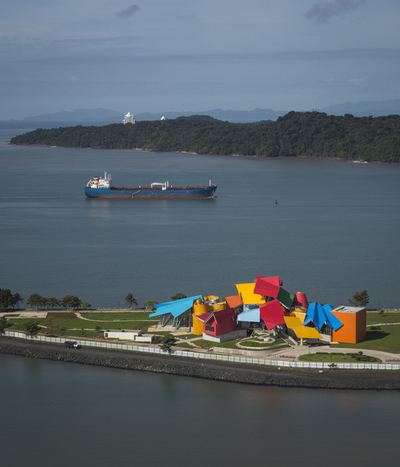 This month Panama opened another construction feat about a different link: the brightly colored, multifaceted Biomuseo. Designed by Frank Gehry, it showcases Panama's role as the last key piece of land in the Central American isthmus that joined North and South America nearly three million years ago — and the consequences it had for the world's ecology. As the junction between two continents, Panama allowed animals from the north to move south and evolve for a new climate, and southern animals to do the reverse. As a barrier between the Atlantic and the Pacific, Panama changed wind patterns, water currents, salinity and other factors affecting climate, causing the regions and the wildlife touched by those oceans to evolve in different ecological directions. The planners set out to make a 21st century natural history museum, and in eight galleries displaying the permanent exhibition, the Biomuseo combines technology, science and art to illustrate the natural world. They also aim to sensitize visitors to the part humans play in what the director, Victor Cucalón Imbert, calls the "living web." To promote discovery, rather than merely provide information, each gallery uses a "device of wonder," like a multiscreen immersive video installation, to explain an important concept, like the climate change caused by the formation of Panama. The idea for the Biomuseo, including a six-acre biodiversity park, started in 1999, as the United States was handing over the canal's administration to Panama. The museum was conceived as a tourist attraction, an educational facility and a part of the country's new identity. 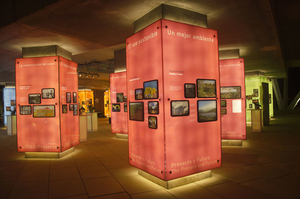 Panama provided the land and loans, while the Amador Foundation raised private money to build and operate the Biomuseo. "People will be attracted by the striking building and the talent of Frank Gehry, and because of the amazing location," Mr. Cucalón said in an email. "But the most important part of the project is the chance to make them look at life with new eyes." The week the Biomuseo opened, he said, the World Wildlife Fund announced that since 1970 the world has lost 52 percent of its biodiversity. "We need to make people fall in love with our environment again, to have new eyes for our surroundings, that we have grown blind to," he added. "This is urgent." The 44,132-square-foot Biomuseo is Mr. Gehry's first building in Latin America, and he took the job in part because his wife is Panamanian. His design centered on an outdoor atrium looped by galleries on two levels, the whole thing blanketed by metal canopies of different shapes and sizes, clad in crayon colors of blue, red, yellow, orange and green. They echo Panama's traditional tin-roof housing and its Neotropical habitat. Viewed from afar, some say, it also looks like the ships that ply the canal. To design the galleries, Mr. Gehry helped enlist a fellow Canadian, Bruce Mau, the founder of Bruce Mau Design and co-founder of the Massive Change Network. The main goal, Mr. Cucalón said, is "to reconnect the visitor with the wonder of what we experience every day." Visitors are greeted with a 26-foot-tall by 45-foot-wide stained glass panel illustrating biodiversity and the state of the environment. To show off Panama's natural wonders in the multimedia "Panamarama" gallery, 10 screens recreate experiences like swimming with a whale, traveling into the forest canopy and witnessing extreme thunderstorms. In "Building the Bridge," three 45-foot-tall rock formations help explain the creation of the isthmus. In "Worlds Collide," which captures the moment Panama was formed, two sculptural groups of large animals stampede toward each other, depicting their migration from one continent to the other. What can people learn from this exchange? For one thing, southern species found it hard to adapt to colder climes. Anthony G. Coates, a Smithsonian scientist who worked on the Biomuseo, has written that "today over 60 percent of mammal species in South America are derived from northern forms. However, only three southern species survived in North America (the opossum, armadillo and hedgehog) although some species, such as the capybara, are still migrating northwards today." Not many natural history experts, outside of Panama, have yet seen the Biomuseo. But Jane Goodall, the British primatologist renowned for her work with chimpanzees, visited three times before the opening and left a video statement saying she was "very, very impressed" and calling it "a wonderful place for learning about Panama's fascinating geology, natural history and diverse cultures." Panama has a lot riding on the Biomuseo, which officials hope will be an economic driver, attracting foreign tourists as well as Panamanians. It cost $60 million, up from an original estimate of $40 million, and the total budget for everything, including educational programs, is nearly twice that. Margot Lopez, a spokeswoman, said "this by far exceeds any other investment in culture in Panama." Of the $115 million price tag, $15 million remains to be raised. And a final three galleries containing aquariums must be completed too. Mr. Cucalón expects them to be finished within 18 months.